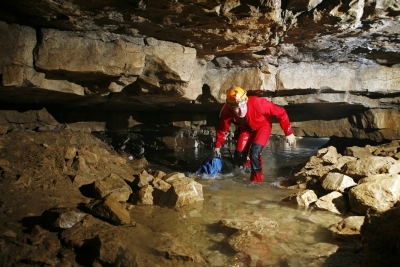 The „Arbeitsgemeinschaft Höhle und Karst Grabenstetten e. V.“ („ working group cave and karst Grabenstetten e.V“) is a non-profit association with currently about 140 members. It was founded in 1973. Grabenstetten is a little village at the northern edge of the Swabian Jura, approximately 40 kms towards the south-east of Stuttgart. The well-known Falkensteiner Cave runs beneath Grabenstetten and is the point of origin for the foundation of our association. What does this dark, cold and humid world hold ready for you? Sharp rocks and tough clay, jaw chattering and dirty equipment? That too, but this is only one aspect when it comes to exploring a cave. We would like to give you an impression of the variety and challenges potholing entail. Hardly any other hobby offers both that many and different possibilities of partaking. Are you interested in this not so common hobby and the Arge Grabenstetten? with us! We meet regularly and do various activities together all related to caves. Guests are welcome.